Bhubaneswar: KIIT Fest is the annual University festival of KIIT University concluded on 11th March. The three day programme from 9 to 11 March was a defining platform for the students and artists to showcase their skills and develop their potential. It is the first and the largest of its kind in east India and hopes to carve a niche for itself in the country. KIIT fest provides an opportunity to let imagination run wild and enjoy the extravaganza to the students. It has workshops for the inquisitive minds, robotics events for the technical aficionados, app making events for the computer geeks, structure challenges for the civil engineers, business plan marathons for the management gurus, competitive debates, dance, drama and quizzing events for the artists and unwinding cultural shows for the freewheelers. Chirag Paswan, MP; Tulshi Kumar, Play back singer; Eli Abraham, Bollywood actress; Hansal Mehta, Film director and Producer; Akhilendra Mishra, TV and Film actor were present in the inaugural session of KIIT fest, where Dr. Achyta Samanta, Founder, KIIT & KISS; Prof P P Mathur, VC, KIIT University and Dr. Sasmita Samanta, Registrar were also present. 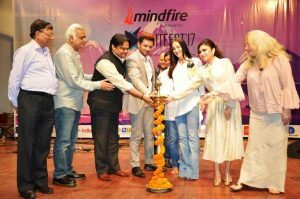 In the second day Abhilas Kumar, Bollywood actor; Chandini Bhagnani, Actress joined as guests while DJ Zaeden performed stage show. It has workshops for the inquisitive minds, technical events to blow your mind, competitive debate, dance, drama and quizzing events for the artists and unwinding cultural shows for the freewheelers. Events including Zara Nachke Dikha (Solo, Duet and Group), Isle to Glory, Ninaad (Prelims & Finals), Riff-E-Random (Prelims & Finals), The Star Salesman, Kalablast (Prelims & Finals), Stand-Up, Does Grey Matter, Word War Db8 Event, Pop Your Collar, Imageographica (Prelims & Finals), Not Just Colours, Open Sesame (Prelims & Finals), Melange (Prelims & Finals), Kiitfest Mun, Dekh Tamasha Dekh, Shabdon Ki Jugalbandi (Prelims & Finals) Mismatch (Prelims & Finals), Joga Bonito, Cricket, Tug Of War, Pedal-O-Thon, International Society (Fun Games), Chess, Musical Chair, Baloon Burst, Scrabble, Film Making Workshop.